One of the most amazing things about doing this blog is the enthusiasm and support I have received from my friends and loved ones. Nearly everyone who is important to me has played a role in this…either as a partner in crime, a supporter or just a “suggester”. I am in awe of everyone who has supported me and continues to. Thanks to everyone who has made a suggestion, helped with a photograph, came along on an adventure, enabled access to cheese, organized a tasting, sent me some goodies or gave me feedback and encouragement and even read this blog! Here’s to more adventures as I head off over the summer to India, Sweden and Australia (Melbourne, Perth, Sydney, Brisbane – you have been warned). Sappiness over, I had the opportunity to try the new menu at the Spice Market Doha which draws on one of my favorite cuisines, Vietnamese. 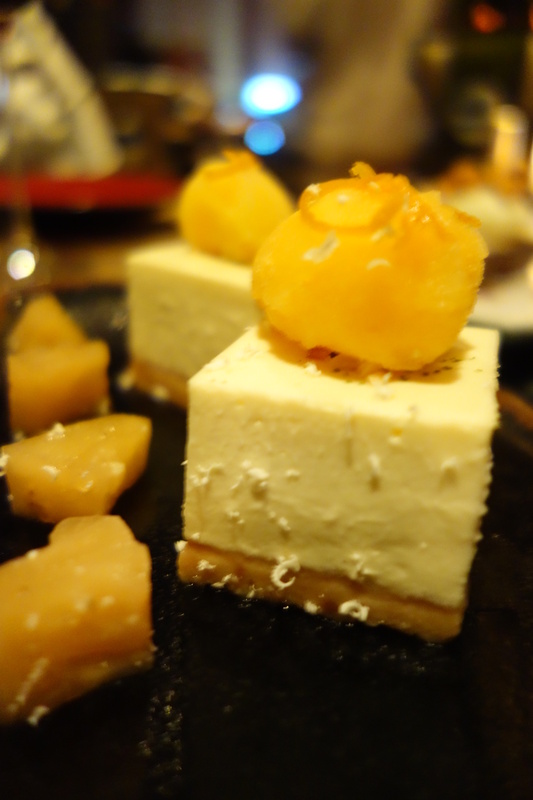 Not being of the sweet tooth persuasion, this Kaffir Lime Cheesecake managed to hit the spot for me. The mandarin orange sorbet offset the sweetness of the cheese mixture. Never has cream cheese been used so well (in my book anyway).